Click "GO" to start your preparedness efforts now or click a link below. Sign-up for Atlantic County Emergency Alerts for wildfires, flooding, hazardous spills, severe weather, evacuation alerts/orders and more. The Office of Emergency Preparedness (OEP) is responsible for coordinating responses to natural disasters, technological emergencies and severe weather emergencies in Atlantic County. The office works closely with local municipal emergency management coordinators to ensure a rapid, well coordinated response to emergencies and to avoid unnecessary duplications of service. During times of severe emergencies or disasters the office activates the Emergency Operations Center (EOC) which is located in a hurricane proof wing of the Anthony "Tony" Canale Training Center. The Atlantic County OEP now offers a variety of training opportunities. It is our intention to provide training for all public safety personnel in the county, and surrounding areas. We offer a wide array of courses for both citizens, and professionals. You can register for courses on line and we offer direct, on-line training opportunities. 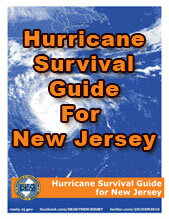 The Office of Emergency Preparedness continually develops and revises Atlantic County's Emergency Operations Plan to address the potential threats to the County. We use what is called an "all hazards" approach to emergency planning. This allows us to inventory and maintain the necessary resources to best meet the needs of any challenge we are faced with. Atlantic County initiated the process for development of its initial Hazard Mitigation Plan in 2008. The County and 19 of its 23 jurisdictions opted to participate. Go to the Multi-Jurisdictional Natural Hazard Mitigation Plan for more details and a copy of the plan.